Click on the map or select a city tab, below. Often designated as “South Bay,” Santa Clara County is located at the southern end of the San Francisco Bay Area, serving as a dynamic neighbor for San Mateo County and many of the East Bay communities. Rectangular in shape, this hotbed of technological leadership is only slightly larger than the state of Rhode Island. Nevertheless, the advancements spawned within the corporate centers and industrial parks of “Silicon Valley” have driven the world’s transformation into a computer-based reality of daily life. Constantly propelled by the genius flowing from Stanford University in Palo Alto, this corner of California has managed to attract some of the world’s brightest minds and most innovative thinkers. This is the epicenter of breakthroughs that change the way the world thinks and lives, the place where Stanford graduates Bill Hewlett and David Packard built an audio oscillator in a Palo Alto garage. Their first order was placed by another California visionary, Walt Disney, who recognized the value of these oscillators for his “Fantasia” project. Another well known fact, Santa Clara County was the place where Stephan Wozniak and his partner Steve Jobs built the first Apple computer. By now, the names of Apple and Hewlett-Packard are household words. Still, a day seldom seems to pass without some entrepreneur or company introducing an innovation in research or technology. Apparently, the adventurous spirit of the “Golden State” has remained undimmed through time. Santa Clara is the name of the county but also one of its prominent cities. 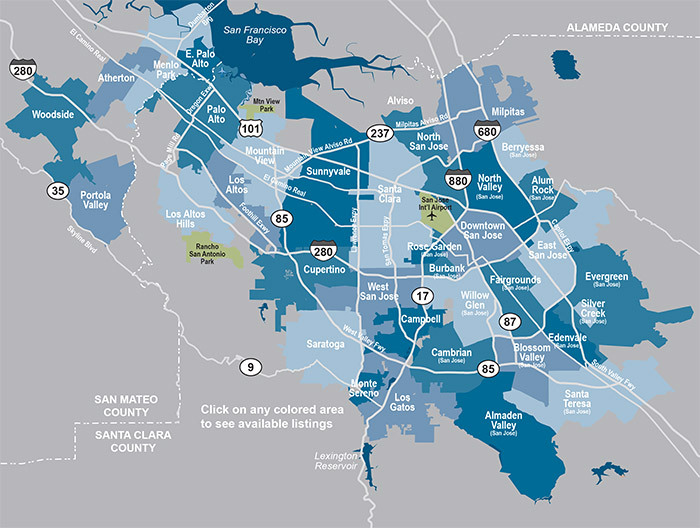 San Jose is the county’s population leader, rapidly approaching the one million mark. The tranquil community of Monte Sereno garners the distinction of the smallest town. Most residents of Santa Clara County are clustered in communities along the flatlands of Santa Clara Valley, a region than spans from the bayfront to Gilroy. Wide and plentiful freeways are just the beginning of the county’s vast transportation network. The entire Bay Area claims a superb network of interstates, major highways, amazing bridges, tunnels, and high-speed thoroughfares. Comprehensive mass transit systems are among the world’s most advanced, providing quick and convenient alternatives to freeways and bridges that become crowded with peak-hour traffic. San Jose International Airport joins the San Francisco and Oakland International Airports as the primary providers of air passenger and cargo transport for the Bay Area. Just around the corner from home, Santa Clara Valley Transit Authority combines bus and light rail service, the latter connecting to CalTrain at the Tamien Station. The VTA’s light rail is one of the longest ever constructed in the nation–a stretch of 20.8 miles. In addition to a collaboration with Santa Cruz Metro on the Highway 17 Expressway bus service, the VTA contracts with a nationally known day-care provider in the operation of the Tamien Child Care Center. This state-of-the-art facility is conveniently located at the major transportation hub of the Tamien CalTrain and Light Rail Station. Newcomers to Santa Clara County can look forward to a progressive attitude toward education that rivals the East Coast’s ivy-league prowess, deeply rooted in Stanford University excellence. The entire San Francisco Bay Area is internationally recognized for its advancements and leadership in education, from award-winning public schools to some of the nation’s most respected private and public institutions of higher learning. In fact, the cluster of state universities in the Bay Area are regarded as some of California’s–and some of the nation’s finest. Hospitals and clinics that enjoy an international reputation for expertise in complex diagnostics and treatment combine with healthcare institutions that offer a variety of specializations. Cardiology, Alzheimer’s treatment, cancer care, mental health, women’s health, pediatrics, birthing centers, neonatal care, organ/bone marrow transplants, burn centers, community education, health screenings, fitness programs, family health and hospice services–a very imaginable need can be addressed in one of Santa Clara County’s premier hospitals or major medical centers.